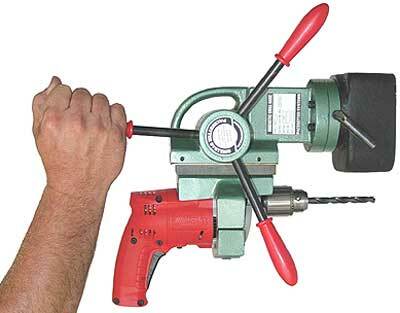 For drilling holes in hard to reach places or when super accurate drilling is a necessity. Up to 800 pounds of holding force in a compact package that gets in places other portable mag drills can't. 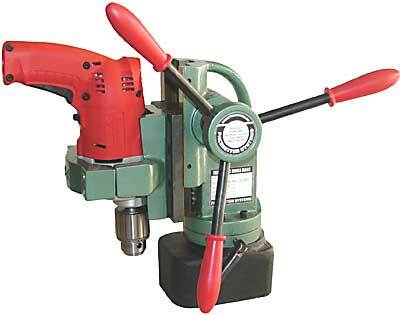 For use with 3/8" Milwaukee Hole Shooter drill or equivalent. Reinforced arms and heavy-duty gears provide maximum drilling force. Adjustable position mag base rotates independently of drill motor allowing you to position the drill with pinpoint accuracy. Compact design makes it light enough to easily set in place with one hand.